The Jazzy Jet 2 Heavy Duty power chair is a full sized chair designed to meet the needs of those who desire a more rugged, heavy duty chair. 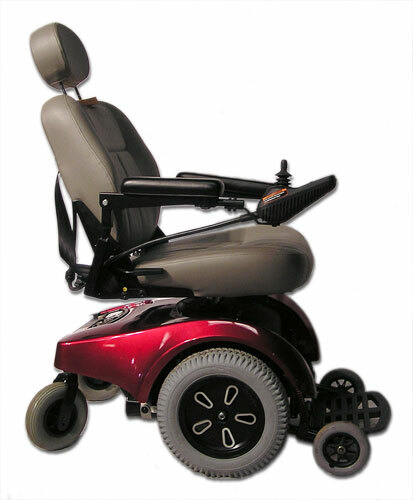 The Jet 2 HD is a Heavy duty model with large 14" solid drive tires that allow the user to travel over rough terrain outdoors, yet this mid-wheel drive chair maneuvers well indoors as well. The Jet 2 HD offers a 350 lb. weight capacity, larger 22" wide x 20" deep high back captains seat and an upgraded PG VSI 50 amp controller with standard 70 amp boost that engages automatically when needed. 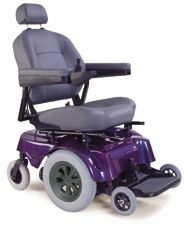 The large 22 nf batteries, auto style seat belt and onboard charger add to the many great features of this wheelchair. All demo models are in excellent condition, and have never been owned. High back captains seat with semi-recline feature, adjustable seat height and back angle and removable, adjustable head rest. Width and angle adjustable padded arm rests. Patented mid-wheel drive design provides outstanding maneuverability. Jet 2 HD - 350 lbs.